Spysee – CTO Hironori Tomobe demonstrated how Spysee’s people search engine extracts information about people from the web and provides links that are related to the person organized in a visual search results page with items like their network connections and a summary of articles written by or about the them. Spysee’s revenue model is advertising based and will offer premium subscription services in the future. Lang-8 – Founder Yangyang Xi demonstrated his new social networking service for learning a language. Basically, one can meet people and learn a language all in one site. A person posts an entry that they want corrected and a native speaker then interacts with you–correcting your writing on-line. Very simple. Their mission is to help learners with the written nuances of a language, something you can’t totally get from formal classes. Lang-8 currently has users from 200 countries, representing 80 languages. Gazo–Pa – Hideki Kobayashi introduced a unique image search engine which is more of a semantic search using image features like colors, shapes, objects to complete its search to give one a more relevant way of searching for the images you want. Kobayashi said that this product is not only useful for images but can be applied to other typical searches like shopping. Their project was developed by funds from by Hitachi Corporation. Launched just 2 months ago, the service has about 70K visitors a month. Coopa – Tsutomu Sasaki, President & Yashuhiro Yamada presented an enterprise application development engine using HTML or Java script. It allow for quick development of custom applications to enterprise software like Oracle or even Google apps. Their development engine allows for quick development of iPhone to Enterprise Software applications for viewing, accessing enterprise software data or using the iPhone as part of an in-line business approval process. Drrop – Founder Takuro Yoshida and Hiro Kobyashi describes their newly launched social communications site as a new way to say “Hi”. A “Drrop”, as they call it, is a random message from around the world, that the user chooses to reply to, let it “evaporate” in 24 hour or “wipe” it immediately to move onto the next “Drrop”. They feel this is a more efficient way to manage the social clutter. Launched just last month, they are in the testing phase with over 150 users and exploring their company’s growth strategy. My Gengo – Robert Laing and Matthew Romaine presented a concept which will transform the translation service, called My Gengo. With My Gengo, you have access to certified translators for as little as 5 cents a word for basic translations which is about 70% less than standard translation services and faster. An API launched in early 2010, is an API that can be plugged into a site so that users don’t need to go to My Gengo to get access to their services. They have experienced non-linear year-over-year user growth overs its few years of existence and have received seed funding and exploring the next stage of funding. 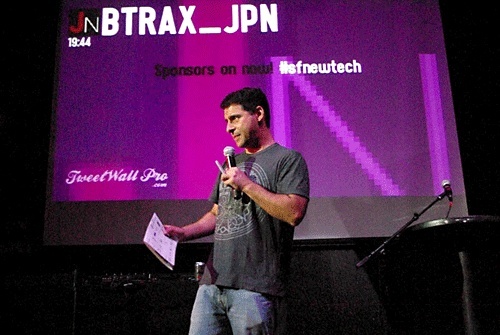 Brandon K. Hill, CEO of btrax, Inc, the co-organizer of the SFNewTech Japan Night event, said “We were excited to see these Japanese companies present at this event. We feel this event was a great success and hope to do this event with SFNewTech twice a year.” All in all, it was a great to see a great introduction of Japanese IT technology to the to the SF tech community. Shunichi Arai is developing a product for his new stealth startup. Arai devotes his life to software business, reading, and salsa dancing. Arai also loves to learn other cultures and languages such as Korean.